Daiken Nelson prepares food at Harlem's All Souls' Episcopal Church, which is a part of a six-week program he runs to help the unemployed gain culinary skills. HARLEM — A Buddhist priest is giving those down on their luck new life skills. Daiken Nelson started a job-training program in Central Harlem to teach the homeless, unemployed and former convicts how to work in a restaurant. 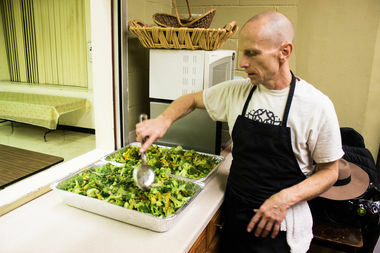 It’s an ambitious initiative — called the Mandala Kitchens Culinary Training Program — to give those who have a difficult time finding work a chance to gain marketable talents, said Nelson, a former social worker. “This is an opportunity to open a door, develop skills and work up through ranks,” said Nelson, who also runs the Mandala Café, a nonprofit catering business. Earlier this year, Nelson laid out a blueprint for the program and started stopping by churches, community centers, nonprofits and restaurants in an attempt to find it a base. He lucked out when the rector at Harlem’s All Souls’ Episcopal Church, at 88 W. St. Nicholas Avenue, allowed him to use their kitchen three days a week for the training. Nelson also recruited a co-teacher and secured funding for the program, which runs for six weeks and gives basic lessons on slicing, dicing and food preparation. On Mondays and Tuesdays, the trainees learn basic cooking and knife skills in the kitchen and prep food for a feed-the-hungry initiative on Wednesday. The program also helps participants receive a Department of Health food-handling certificate, which could boost resumes, Nelson said. Nelson said, as the program continues, he wants to work with local restaurants to create a pipeline to place trainees in kitchens across the city. “They can walk into a place with experience and credentials,” he said. So far, three people have completed the training and Nelson is hoping to start a new class in January. He also plans to more than double participants. His hope is to eventually open a pay-what-you-will cafe, where people will offer donations for their meals. “It could be a space where people who are also doing training could also have work,” he said. Those interested in the program could sign up by visiting http://www.mandalacafe.org and contacting Nelson.